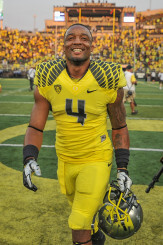 Erick Dargan nabbed seven picks for the Ducks, and they will need to replace his production. Troy Hill, Ifo Ekpre-Olomu, and Erick Dargan are gone. Reggie Daniels returns as the only player with truly valuable experience, but even he will have eyes on him considering the loaded group of youngsters that are eager to take his place. 2013’s top recruit, Arrion Springs will be looking to compete for one of the corner spots, along with the favorite to nab one of those spots, Chris Seisay. Seisay is the only one outside of Daniels with any valuable experience in this group. Springs’ classmate, Mattrell McGraw, and freshman Ugo Amadi will also both make serious runs at starting roles. Theoretically there’s no such thing as being too deep at a position, but if there was Oregon might be in serious trouble at the WR position. Bralon Addison returns from injury, and new freshman Alex Ofodile is also expected to turn some heads. Those two, on top of the returning Devon Allen, Dwayne Stanford, Jalen Brown, Byron Marshall and Darren Carrington will make for quite a competition. Carrington is suspended for the first half of the season, so that should make it a little easier in the early going, but once he returns the Ducks will have some very tough decisions to make. Wideouts that were household names in Eugene last season might not even see the field. It’s not the deepest competition, nor is it even that exciting really. Vernon Adams Jr. is expected to start the second he steps on to campus for good, but here’s the catch: he’s already behind. Adams might be the best candidate for the job, but not getting to practice in the Spring is huge. 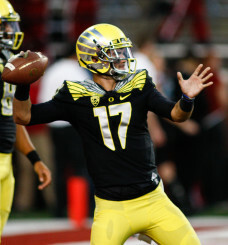 Jeff Lockie has the most experience of any returning Duck QB. 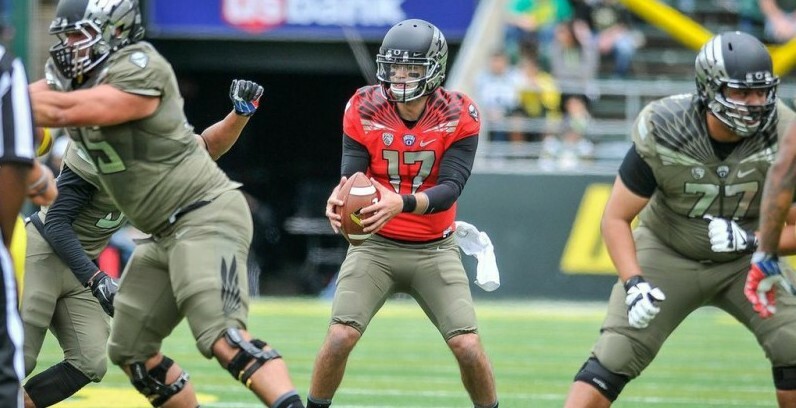 Veteran Jeff Lockie has a huge advantage in terms of experience compared to the other candidates, but freshman Morgan Mahalak has shown flashes of greatness and could ultimately be the most promising QB in the depth chart right now. But of course it’s never that easy. Freshman Travis Jonsen, formerly Travis Waller, has made a huge impression in his short time here at Oregon, getting praise from the likes of Mark Helfrich even. In short, no one knows who will be starting under center yet. Stay tuned to FishDuck.com for Spring updates.